One Lap Of America is a set of driving competitions mixed with a non-competitive road trip. It starts and finishes in South Bend, IN, from whence you drive 3245 miles during the week to compete at tracks in Nebraska, Colorado, Texas, Oklahoma, Kentucky and back home again in Indiana. There are 18 planned track events, of which 13 are time trials on road racing circuits. There are three drag races and two skid pad events. Scoring is based on overall ranking (not time) in each event. Since you need to drive (transit) between events, One Lap is for street legal cars. There are 13 classes. 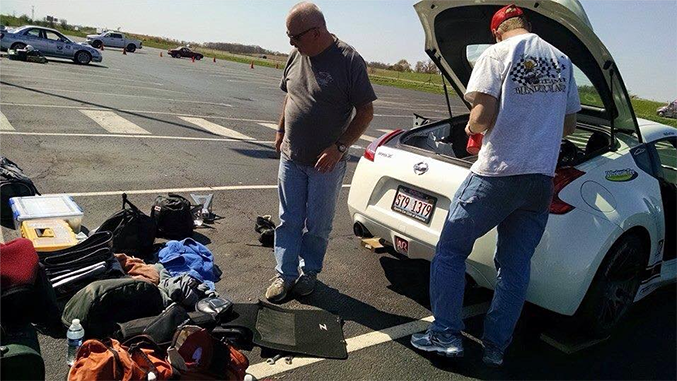 For our report on OLOA we engaged the eyewitness team of Tracy Ramsey and Jason Cange (Team Blenderblaster), who ran this year’s event in a 2012 Nissan 370Z sponsored by Winding Road Racing. The 370Z fits into SSGT2 (cars under $50k) Big Bore (engines over 3.5 liters). Up against Corvettes, Mustangs and Challengers, you would think they would be at a disadvantage. But, as we know, what you think and what actually happens can be different once the rubber hits the track. Tracy reports: So much has happened over the last day or so. And this is just day 1 of OLOA. But first, some background. 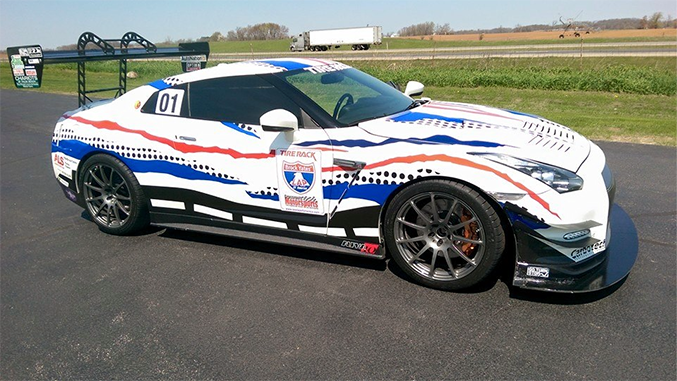 In January of 2014, my wife and I bought a used 2012 Nissan 370Z, which became her car, with the explicit understanding that it would be run in the 2015 One Lap of America. That meant 2014, and some of 2015, became the window to prepare this car for the trials and miles that make up the One Lap. The list is long of parts added, removed, modified and worked on so this car would (hopefully) be trustworthy. Well, yesterday was the culmination of all that time as we arrived in South Bend, Indiana, for a welcoming party for the One Lappers (often referred to as the Lap Dogs). This morning, Jason and I woke up to a glorious day that would eventually find its way into the 80's (by northern standards, a pretty darn nice day for May 2nd). We headed off to Tire Rack for the first event and registration. 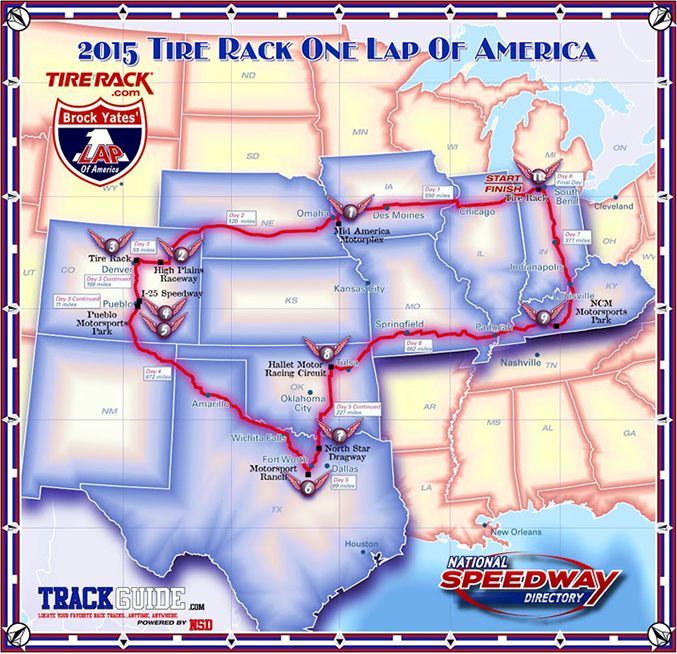 I would be remiss not to thank Tire Rack for their continued support and sponsorship for the One Lap of America. We prepared the car by first emptying out the back of the car of our supplies, tools, clothes, etc. that we will carry with us all week. We also took this opportunity to check out our competion in the SSGT2, Big Bore class. SSGT2 Big Bore means sports cars under $50,000 with an original engine displacement over 3.5 liters. Aftermarket updates are a free for all. Our class consists of some older C5 and C6 Corvettes, many new Mustangs, and one Challenger. One of the Mustangs was built by Gas Monkey Garage and puts out 700HP. That is about double of what we have in our 370Z, so we knew we would have our work cut out for us. 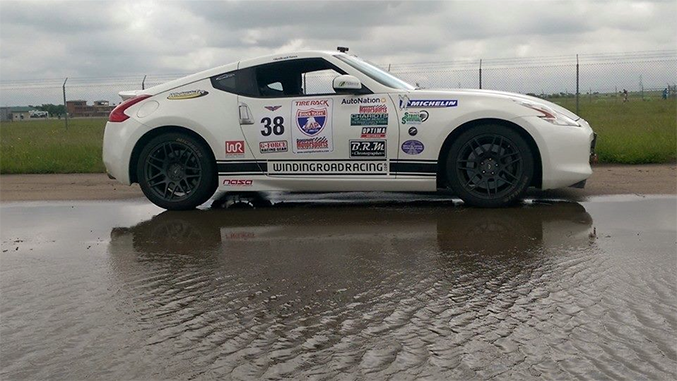 The first event is a wet skid pad, Having extensive rain experience in my Spec Miata, we decided to disconnect the rear swaybar in an attempt to keep the car balanced, and be able to transfer the weight to the outside tire better. That was the only real change we did along with lowering our tire pressures a bit under recommendation from one of the Tire Rack specialists I have known for a long time. 57 cars took to the the Wet Skid pad and we hoped that our Michelin Pilot Super Sports would be all of the wet tire that it is made out to be. Looking at the whole field, Nissan GTRs did quite well but it was a Viper that took the overall win, with a Porsche mixed in there. 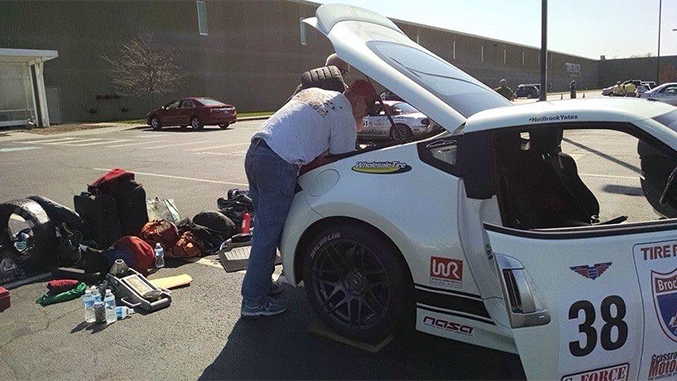 The 370Z exceeded our expectations and we took home a 13th place overall finish, with a 2nd place in class. There was no real time to celebrate as we had to pack the car back up (you really wouldn't believe how much we can fit in the back of the Z) and hit the road for Omaha NE, and the next leg of the OLOA at Mid American Motorplex. Then off to the hotel for a few hours of sleep and back to the track in the morning. Tracy reports: The storms were raging as we pulled into our Omaha hotel last evening, so we were thankful as we fell into our beds and were awakened by a bright sunny day. A quick breakfast and off we went, back to Iowa to the Mid America Motorplex. This hidden gem south of Omaha is a beautiful flowing track with some high speed areas, and some very technical sections where setup, and handling, are the key. Team Blenderblaster was still on a high from our results the day before (13th overall) but we realized that in the Big Bore class, our little 6 cylinder Z might have a very tough time keeping up with the rest of the class on an open track with their V8's. MAM boasts the longest straight among the 2015 OLOA tracks, a fact that had us worried. We checked our tire pressures and did a quick review of a MAM video we stored in our library. Deciding that I would go first to get a idea of the car's handling and get some good video, out I went with our run group. If you don't know how the One Lap is run, the cars are divided into 4 or 5 car run groups out on track at one time. The cars leave the pit at intervals and are sent out on a "reconaissance" lap after which they stop at the Start/Finish line. When they are all lined up again, the starter releases them, again at interval, to keep cars from having to pass while each is doing a three lap run. After they run, all the cars return to the pits and the next group goes out. It took most of the first lap to warm tires and bring the pressures up, but after that the Z came into its own and we ended up catching the last car in the group. Since it happened at the start finish line of last lap, it didn't hurt my time at all and we awaited our results. Imagine our surprise when we were shown leading the class, getting a 19th place overall finish, and actually moving up to 11th place overall in the cumulative standings! It was a great run, we felt we were off to a great start, and Jason was already anxious to get to the afternoon runs. Jason, unfortunately, hadn't run the car since summer of last year. Understandably, as he went out his first lap was a bit off the pace we had hoped for, but by the third lap he was within two seconds of my best lap times. From our distant attempt at timing him it was originally thought that he was about 15-18 seconds off of the three lap pace, leaving us a bit disappointed but knowing that he had picked up a lot of speed and confidence in the car by the third lap. Once again, imagine our suprise when we found out he was only 9 seconds off the three lap pace, and finished second in class! It appeared that we were entering a 2-way battle with the Corvette of Jim-Bob Racing in our class. The Z and the Corvette have swapped places each of the 3 events, with the rest of the class a bit behind the two of us. Our results today also leave us in 16th place overall in cumulative standings. Tracy reports: Ahhh..the glory of being a One Lapper. We arrived in Brush, Colorado last evening.and joined friends in a celebratory snack of Budweisers and Ann Hollis' Cookies™. Accompanying this fantastic meal was the standard of viewing videos of the next day’s track. That track was High Plains Raceway, a track owned by racers. It truly is out in the middle of nowhere. The track itself is fantastic. Just over 3 miles in length, it has one very long straight, one shorter one and then many chutes connecting the wide variety of turns with no shortage of elevation changes. The next day, we arrived early so we had time to walk the course, and were very glad we did. Video did it no justice and seeing the turns and elevation up close gave us a greater appreciation for the beauty of the track. We also came upon the conclusion that horsepower was going to rule the day. We would have to just try to do our best. Jason decided, after walking the course, really felt connected to the course. He went out and couldn't speak highly enough about the experience of driving. Sadly our little Z didn't have the horsepower of some of the leaders and struggled to a 4th place in class finish. I went out next for the afternoon sessions, and had a nice improvement on Jason's times. But everyone else improved their times too. Once again we settled for a 4th place in class finish. Really not bad considering the number of cars we have in class (8) and knowing how much power each puts out. We are currently 2nd in class, 25 points behind the leader and hoping to make that up. We sit in 21st place overall at the moment and working on improving that too. After racing, the entire One Lap field headed over to the Tire Rack's newest distribution facility in Denver. Dinner amongst the tires was provided for all with some yummy local barbecue. It was nice to sit down and talk with all the other racers and shoot stories about everyone's experiences so far. After a relatively short drive to our hotel, Pueblo Motorsports Park was up for the next day. The forecast was for wet in the morning but we were thinking this might actually play right into the hands of our 370Z . 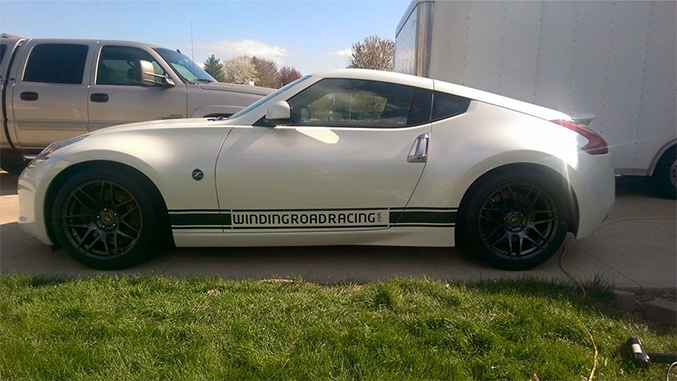 Tracy reports: It appears that the rumors of the demise of the 370Z were greatly exaggerated. We woke on the morning of Day 4 to a slight tequila haze and wet weather. Pueblo Motorsports Park is a multi use facility that has not only a 1/8 mile dragstrip and connected road course, but also a large amount of land that appeared to be set aside for dirt bikes and ATVs. Note, also, that I said the dragstrip and road course are connected. And this is where the problems started. With all of the rain, the dragstrip itself (at least the start to finish lights) was unusable due to all of the rubber and the VHT compound. All of us found it odd that a compound that was used to give traction could be so absolutely like ice when some water was added. Brock Yates Jr. weighed all sorts of options as to what to do with the event, and ran them by the competitors. We settled on starting where the pit access road connects to the dragstrip, and following the road course until it finished at the drag staging area. This meant that these were one lap runs, so it became basically a Solo 1 autocross. Being the closest thing Team Blenderblaster had to a rain specialist, I took over the driving duties for both sessions. We both felt that the car looked good on track and we put down what seemed like a solid time, but no results were posted before we had to head up to the line for the second runs. As soon as we did that, the rain stopped. We were the 17th car in line and looking at a wet, but drying track. The fickleness of Mother Nature had reared its ugly head as we went out in wet conditions, but the last 15 or 20 cars had a very nice drying track to work with. We quickly packed and were on the road to Texas when we finally received our results. 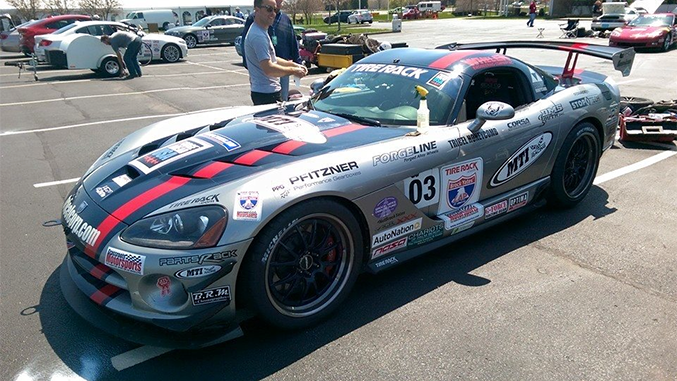 Our first run netted us a great 13th place overall finish, ahead of many of the top running cars. Unfortunately our second run, while improving our time by 2 seconds, understandably only netted us a 19th place finish. Sadly, we only finished second in class on both runs, as Gas Monkey Garage and their Brenspeed 700 HP Mustang won both ends of the event and brought themselves up into the hunt for the overall lead. On the good side, the class leader finished 3rd and 4th in their two runs as everyone closed in. So now we still sit 2nd in class, and are up top 16th overall. In one of the oddities of One Lap scoring, we were behind the Jim-Bob Racing Corvette in class points, but 3 spots ahead of them in overall time. Waking bright and early so we could get our track walk in at Motorsports Ranch in Cresson, Texas south of Fort Worth. We had spent much of the evening before looking at video, but I assure you that video gives no justice to this little playpen of a track. This is a course that can be separated into two courses (1.3 and 1.7 mile) or combined into one course that would be 3.1 miles long. OLOA had gotten us the ability to run all three configurations. Jason suggested, and I agreed, that a single driver should drive all three configurations as each separate track would "build" into the longer course. So we walked the courses in the morning and were just awed by the compact nature, and elevation changes in the short 1.3 mile course. There would be no rest driving on this side! Moving over to the 1.7 mile course, we noted more of a traditional straights-and-sweepers course, which was very different from the short course. This side would probably be more demanding physically from the G load going through all the fast sweepers. This was the first time on this track for almost everyone, so it was a pretty fair battle for times that would test the driver's ability to learn a course quickly and apply that knowledge. Strapping on the helmet, Tracy took to the short course. I felt that the Z was handling pretty well here and once the tires heated up and brought up pressures, it was a really fun time driving around. Hot and exhausted, I headed over to the long course after a quick stop for a tire pressure check. The 1.7 mile configuration was where I thought our main competitors would have a leg up on us with all the straightaways. I tried to pedal the Z as fast as I could through the sweepers to make up for the deficit of acceleration to the Mustang and Corvette. This course also had a small very technical (think autocross) section called "Rattlesnake". Because the course was new to everyone we saw some very “interesting” lines in this session. The long course was a hoot! Raw speed and high G sweepers followed by that bullring on the short course, and transition back and forth. It really tested the drivers and the cars, as many people complained about cars getting too hot, or just overheating. Even with the added oil cooler, the Z was running at 240 degrees oil temp. Well, long story short, we had a banner day. We won our class all three sessions, and overall finished 16th on the short course, 17th on the long, and 16th on the combined! This also vaulted us into the lead in class as Jim Bob Racing had quite a few issues on the course and dropped back to third in class behind the Gas Monkey Mustang. A quick pack, a side trip to Gas Monkey Grill (event sponsor), and then we headed to North Star Dragway, a 1/8 mile strip north of Dallas. Since I drove all of Cresson, Jason was about to get his initiation into drag racing. We talked at length about starts and Low ET, and how bracket racing works. We were both very worried about his event because, simply put, we were missing two cylinders compared to all those big V-8's. Our goal was not to finish last in the low ET, and get a few rounds into the bracket racing. Jason ripped out a darn nice 9.29 in the 1/8 mile which was good enough for 4th place out of 8 in class, and actually ahead the Gas Monkey 700 hp Mustang. That car basically had a diff hopping, wheel spinning, 1/8 mile burnout. Not pretty, but it enabled us to gain points. Next were the brackets. Jason went up, staged, blinked and opened his eyes to a green light already on. Those who drag race know that this is NOT the fast way, and it spelled an early retirement to us on the brackets. Jason was a bit upset with himself but having done the same thing, I consoled him and let him sit and relax a bit as we loaded up and headed to Stillwater, Oklahoma. We awoke this morning a bit tired from a late night skirting weather the previous evening, took a quick shower and headed out for a 40 mile drive to Hallett Raceway. Hallett is an older track, but has been mostly repaved. One Lap of America visits this track often as it is at a "bridge" location between the east and west sides of the country. They love OLOA here! Hallett is a wonderful, short (1.7 miles) combination of blind apexes and hills, straights and off camber turns. It is truly challenging for a seasoned driver, let alone someone who is new to the circuit. With slow turns follow by straights, it also lends itself to higher horsepower cars, which became apparent after the day was over. Jim Bob and Gas Monkey both had experience on this course and kept telling us how much fun we would have, and we were looking forward to it. Jason decided to go first as he still had a chip on his shoulder after the early bracket racing exit. Once again, some video studies, and some track walk and we came up with a plan. Plans must be executed, which is often the hardest thing to do. Between the blind corners and exits, and the difficulties in learning the course, neither of us had a particularly good day. Jason ended up finishing 4th in class, and I wasn't much better with a 3rd place in class in the afternoon. Overall, these times were only good for 29th and 24th overall. Still, Team Blenderblaster is sitting 1st in class, but our point lead has shrunk to 25 points ahead of the Gas Monkey Mustang. Jason reports: This event is very long and daunting with a lot that needs to be learned in order to get your maximum out of it. I can tell you that at the beginning of the week I was definitely not getting the most out of myself. Tracy was quick and making hay over the competition early and often. I was not. We have both raced together a lot over the years and he knew I had the speed in me. He stayed patient and supported me where I needed it to extract that speed. In a long event, that support can be crucial. 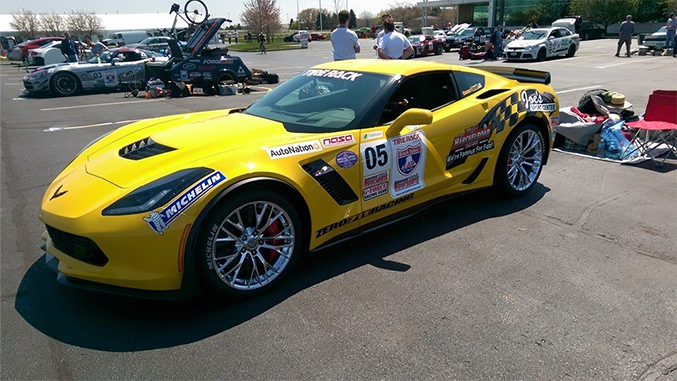 Today was a make or break day for us at the National Corvette Museum track. Going in, we had just a 25 point lead over the second place Mustang of Gas Monkey Garage. This was the last day of road course events so we were down to the wire. Our strategy was to put Tracy out there first, as he had run a portion of the course with our friends Ben and Dan Schaut in ChumpCar. This approach panned out well as Tracy took 13th overall and first in class by 20 seconds. As luck would have it, our main rival did several pirouettes as he misjudged the fast chicane at the end of the main straight. He still managed to get 3rd place but with our win, the lead had extended to 35 points. Now the spotlight was being shined brightly in my direction. So far I hadn't been able to gain our team points in the manner I would like. I took the video from Tracy's run and poured over it intently, then sat down with Tracy and discussed all of the finer aspects of the braking points, turn-ins and throttle applications. As the temperature climbed to 89 degrees so too did my anxiousness. Time to legitimize my invite to join this event. On the recon lap I worried the C6 Z06 ahead of me enough to get a pass by before the start. That was a boost. I launched with the intent to do the three fastest laps I had even run on that track. Let me tell you, those three laps were some curb-jumping, tire-squealing, vehicle-pounding enjoyment. Once I got back into the paddock area Tracy greeted me with the news that I had narrowly beat the 2nd place Gas Monkey Garage Mustang by one second on his stopwatch. Now it is not easy to time these gaps accurately so we had to wait forever (it seemed to me) for the official results. Drum roll please...I took first place by 1.2 seconds over the Gas Money Garage Mustang, leading to my first win in class this week. All of the work Tracy put in with me paid off. Even better, with our team picking up two wins today, we increased our lead to an insurmountable 40 points, with just the Dry Skid Pad event left tomorrow. 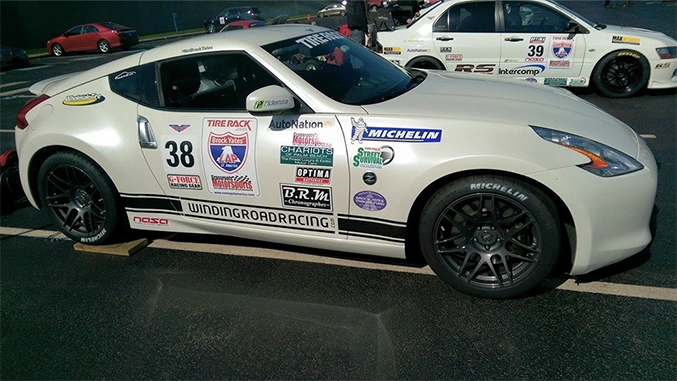 Tracy and I had secured the SSGT2 Big Bore class championship for the 2015 One Lap of America. What an event and what a way to spend the week after turning forty! Now it was time to honor the spirit of Team BlenderBlaster: fill up your cup because it's time to party. Tracy reports: “Eight days a week” says the song and that's what it feels like on our last day. We awoke from short night of sleep after a long evening, and the teams rolled into their cars. The group was generally divided into two camps: those who were done driving for the week, and those who had to drive in a circle as fast as they could while feeling a bit "under the weather". Thankfully Jason had the skid pad today, and I only had to unpack the car, and repack after it was all done. Due to the rain the evening before, we arrived at the Tirerack to a semi damp pavement. We still had plenty of time to go as first thing on the agenda was the "Survivor photoshoot" where a picture is done from a crane of all the cars that survived this year’s event. Looking around we noticed that a full 25% of the cars that started the event fell out due to some reason or another. This, I was told, was a fairly large amount of stricken cars and we counted ourselves happy that the 370Z was essentially bulletproof. Now all the cars went back to paddock an started lining up for the final event, the "Dry" skid pad. Jason arrived there as it was somewhere between a dry line and totally dry, which were fairly good conditions to see what the Z could do. All that we had done to our Z’s suspension were some camber arms, a front swaybar, and our tire setup. Normally the 370Z comes with a staggered tire setup of 245 width tires up front, and 275s in the rear. Due to the constraints of room inside the car on the transits, I decided to go with a "square" setup and put 285s on 18 x 10 inch rims all around. We were very happy to see that the car pulled 1.004 Gs on the skidpad. This was enough to place us 14th overall, and just out of 13th, which was a great way to close out the event. It was hard to believe, as we packed the car for the ride home, that this week was over. The event closed out with the awards ceremony amongst thousands of rims and tires inside the Tire Rack facility. It overwhelming smell of rubber mattered little to all as we gathered for one last meal together and listened to Brock Yates Jr hand out all the awards for the top finishers, and some of the more special awards given out. We were happy to take home the award for First Place SSGT2 BB, and will proudly be displaying that on my mantle. I should also say that a trophy seems so much of a side note to the memories of the entire event. All the miles, the transits, the tracks, the impromptu gatherings and the search for restaurants on the side of the road will be remembered for a long time. 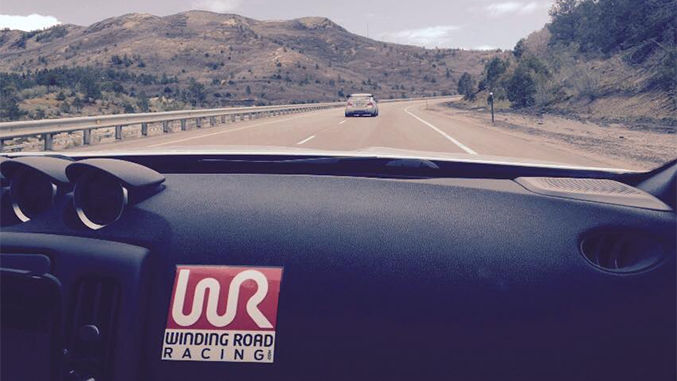 We also would like to thank our partners in this venture, Winding Road Racing. Oh, and big thanks to my wife. I was pretty motivated to return her car in one piece.